Sitting through Top Five, I struggled to remember the last time I had sat through and enjoyed a crass R rated but also quite intelligent, coherent and funny comedy. The only ones that come to mind are Horrible Bosses and This is the End but even these don’t mash up all these attributes like Top Five does which could have easily been the recipe for disaster we’ve seen time and time again. 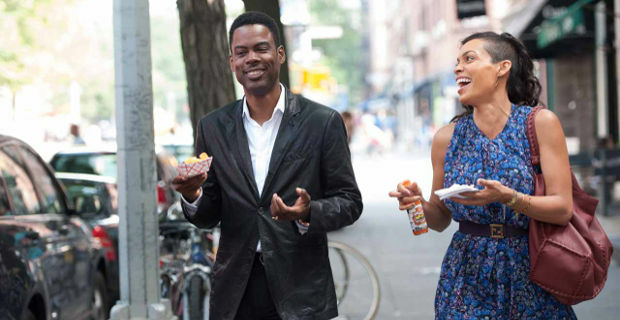 The title of this film, directed and scripted by Chris Rock, is a riff on hip hop enthusiasts naming their top five rappers of all time. We get artists ranging From A Tribe Called Quest to Biggie but sadly no room for the godfather of hip hop – Vanilla Ice. Rock stars here as Andre Allen, an actor with roots in comedy who has raked in a truck load of money thanks to his dumb franchise, Hammy the Bear, which sees him suit up in bear costume to play a cop with the corny catch phrase: “It’s Hammy time! The huge comedy bucks aren’t enough though and Allen wants to be taken seriously so he has starred in a staid film he tags “ Haitian Django”, Uprize, which is about a Haitian slave rebellion I’m not sure is real of fictional – I haven’t bothered to check. We meet our central character at a time where he is trying to get some PR for his movie but even ignoring the ridiculous clips of Uprize, we sense things are not going well and besides, all anyone wants to talk about is his upcoming marriage to a reality TV star, played by Gabrielle Union, which has picked up more PR momentum that his own film. This commitment means Andre is tagged by camera crews and has his every move in the build up to the wedding scripted in line with the current culture of reality TV. This may not be apparent to all but it’s interesting the parallels Rock’s character has to Eddie Murphy especially when the reluctance and fear of a return to comedy comes up. Some people want see Allen in a Hammy costume again and others just want to see him on stage again doing comedy and the same could be said of Eddie murphy although I doubt the list of people who want to see Murphy back in a Klump fat suit stretches around the block. Aside the Murphy undertones the film does take its digs at the entertainment and film industry with a degree of subtlety in some instances and then ratcheting it up for others. We get some insight to what Rock maybe thinks about comedians getting serious via a hilarious DMX cameo then there’s the road experience with Cedric the Entertainer and a couple of groupies where things get egregiously and unnecessarily nasty but still positively cringe worthy and funny. My personal favourite was a certain scene that required some “stank”. The script is almost like a stand-up set with jokes and punch lines bursting out the seams at each turn but Rock does try to keep the humour organic save for the Cedric the Entertainer sequence which was still not without genuine laughs and on the low, I wonder if I was the only one getting vibes of some Luther Vandross gags in there. It isn’t all fun and games though as Rock still tries to endear us to his central character through the conceit of reporter from the New York Times (who have been quite unforgiving to his Hammy films) profiling him. This reporter is Chelsea Brown played by the lovely Rosario Dawson whose presence kind of gives the film some Linklater-ly feel as Rock and Dawson become Ethan Hawke and Julie Delpy respectively. They stroll around the big apple sharing stories as we slowly get an entrée into what makes these character tick. There is admittedly a contrivance to their journalistic arrangement but is easily overlooked as the two characters just bounced of each other with an ease that never becomes tiring and is one of the films strong points. There is a wonderful sequence were Allen returns home with to friends and family to catch up and play some 2K and the topic of the top five even comes up and all this is experienced seemingly through Chelsea’s eyes. The film gets all mushy in the third act as the film narrows in on the 12 hour or so relationship forged between Allen and some may struggle to buy what the film sells at that point but the consistent humour the film serves up is a decent fall back for the overriding conceit. Top Five is not without its flaws (most of which you have to be nit-picky to find) but it’s heart is in the right place and it helps that the main selling point of this film, it’s humour, is never faltering and on point along with the numerous celeb cameos from Kevin Hart, Jerry Seinfeld, Whoopi Goldberg etc who bring more laughs and the main duo who give us likeable central characters and a story to give this film some substance. I’m not a big into hip hop but I myself do have something resembling a top five heavily doused in nostalgia: Lauryn Hill, Fugees, Arrested Development, Reggie Rockstone and Eminem.